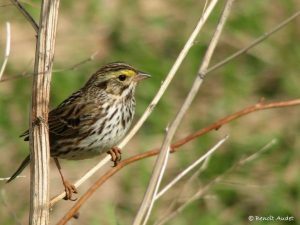 The Savannah Sparrow is another bird species named for the location of its first discovery and description by western ornithologist. One interesting fact about this bird is that the female Savannah Sparrow is able to scrounge up to 10 times her own weight in food in order to feed herself and her hatchlings! Each week we introduce a new bird from the Ottawa-Gatineau area. Alex MacDonald, Nature Canada’s Manager of Protected Areas, shares interesting facts about the birds that live in our communities. Catch up on past episode here on our website. This episode aired on Saturday September 3rd, 2016.